I'm thinking about putting some chrome on the bike. The Faco bars are out because they are only a single bar. Cuppini is nice but I like the way the Piaggio bars go up in the back and attach. I am wondering if there is a brand of chrome that will look great and attach without me having to take off the rear reflectors? Also, I saw someone post a video online that showed taking off the whole bottom half (the plastic part) of the cowls to put on the bars. Is this the case with all of them or do some just mount without taking the bike apart. I can get them installed at my local shop but didn't want to shell out about $600 for the whole kit when all I want is the rear bars and maybe the front double bar for the front fender. -I am wondering if there is a brand of chrome that will look great and attach without me having to take off the rear reflectors? -Also, I saw someone post a video online that showed taking off the whole bottom half (the plastic part) of the cowls to put on the bars. Is this the case with all of them or do some just mount without taking the bike apart. -I can get them installed at my local shop but didn't want to shell out about $600 for the whole kit when all I want is the rear bars and maybe the front double bar for the front fender. My advice would be to buy what you want and get it installed by the local shop. It's like saying shazam and then you just give them money afterwards. Works for me. You don't have to buy the whole kit, just buy the rear crashbars. The shop can then take the bits offf that you don't want to and put it back together again. You don't have to take the WHOLE scooter apart. Any crashbars that are not bolted on to the frame (if such a thing exists) are going to be decorative only and completely useless to you in a bingle. 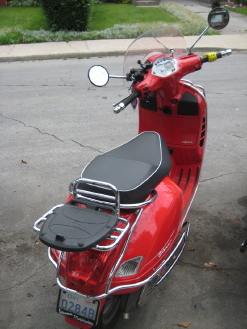 I just installed the rear crash bars from the Piaggio "Full Chrome" kit yesterday. Installation was simplicity itself and removal of the cowl side reflectors or lower cowl plastic pieces was not required. There is a bracket that clamps crossways under the rear of the floorboards that is quiet rigid. The front of the crashbars attach to this bracket and the rear is attached where the grab handles under the seat were attached. It was about a 15 minute operation. Motorsport Scooters has the full kit on clearance at $399 - crash bars, front and rear carriers, and front fender protector (which will require reflector removal). 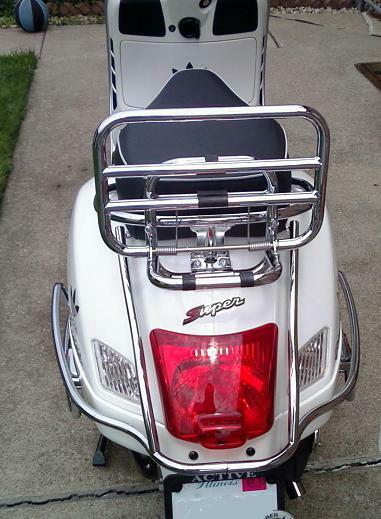 The Piaggio rear crash bars don't require the removal of the reflector. The chrome is of good quality, too; better than the Faco or Cuppini, IMHO. 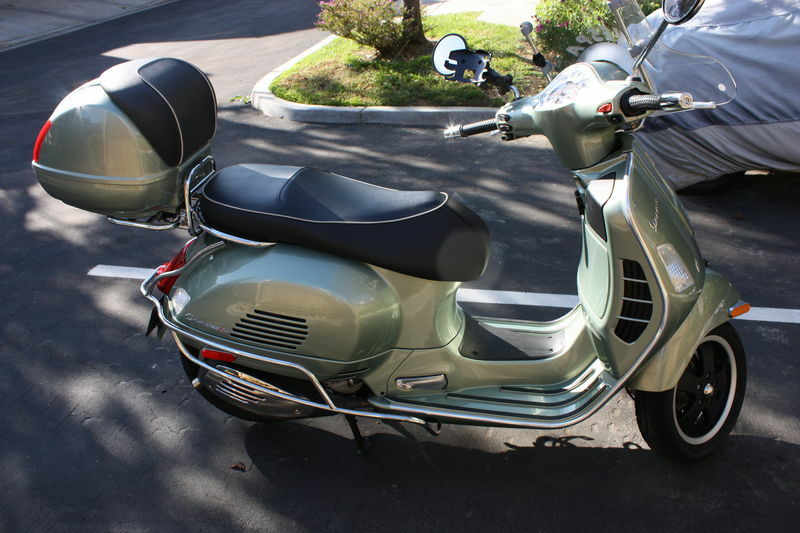 Neither the Piaggio or Vespa rear crash bars requires removal of the side reflectors. If you look at the kit for $399 on sale at Motorsport Scooters, it doesn't say anything about removing rear reflectors. 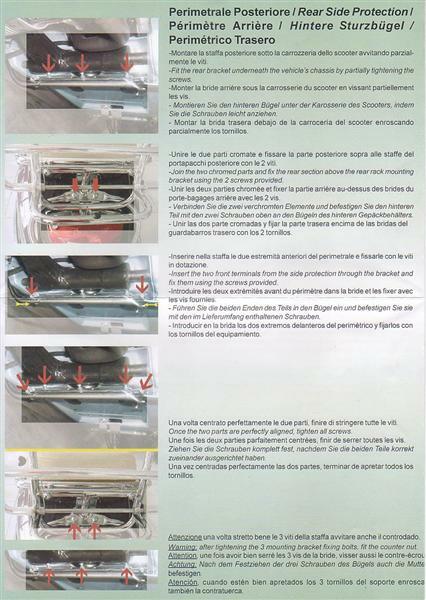 However, the bars that state they are for the GTS (which would or would not be different from the GT200) state that rear reflector removal is required (see Part Number: GTS12P). The GT and GTS have different lower rear cowls and rear end panels, so the mounting is different. Here are the Piaggio bars on my bike. As you can see, the reflector is still there and in the original location. could remove the lower cover without any problems. I like the Piaggio crash guards the best. I don't know how you would be able to do that without some significant modification. 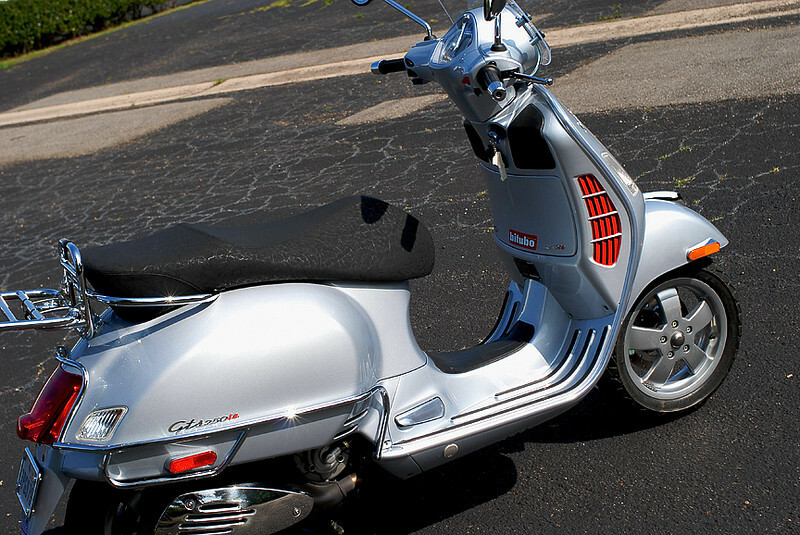 The Piaggio bars are designed to connect to each other over the brake light. Yup, no need to remove the reflectors for the piaggio bars. I just installed some on my GT. I think I did it right, but I wanted to make sure... Do the bars come out further away from the cowls more towards the front of the scooter? Thanks. wondering if the Faco rear chrome bars are good/comfy foot rests for passengers or if it is too close to the cowl. Any one with the Faco's care to comment? Which come in handy at shopping plaza parking lots and wayward shopping carts. But once you've learned the knack, You won't look back. They look really nice too, I like the way they follow and protect the tail light. I know you said Faco was out, but wanted to give you another perspective. Yes single bar with double bar in back, and you can keep your reflectors on as well. Does FACO make rear crash bars for a GTS300 Super? Are they just sturdy as the Vespa OEM? The Vespa wrap up teh backside, so does that help displace the impact of hitting the ground? Any rear bars that fit the regular GTS 250 will fit the 300 Super. The OEM bars will give you the most protection in the event of the bike falling over. From here, i learn that fixing the chrome bars can be A DIY thingy.. 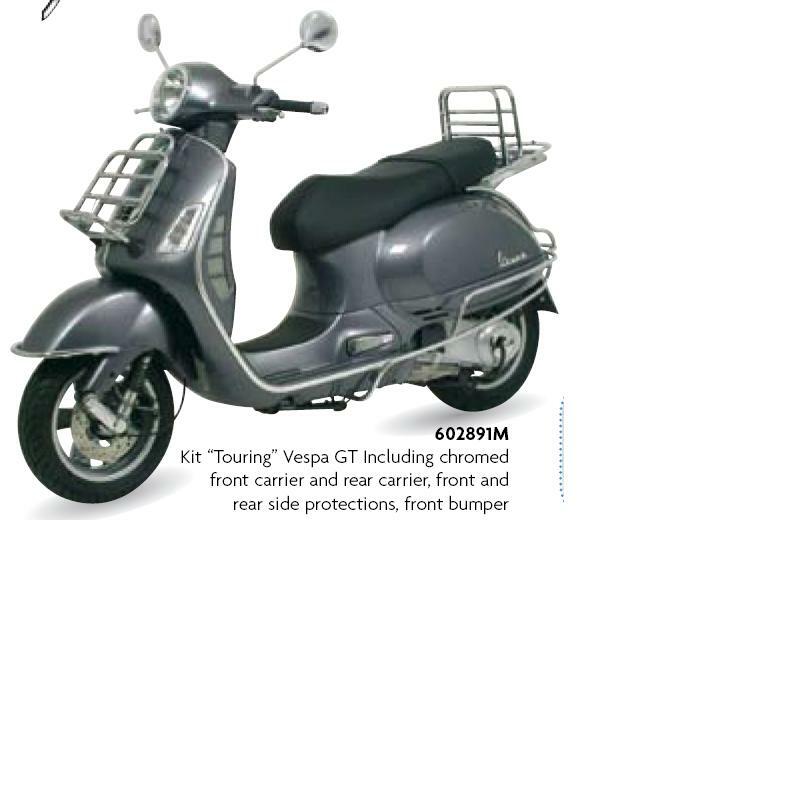 Anybody have the instructions for installing the Vespa bars? These were for the LX/V but give you an idea. D/l the pic and zoom it up. I think these bars look great and really stand out, but would they offer much protection to the frame/panel if I came off, or are they just for looks really? Depending on the drop they can help protect the cowl paintwork. Have a look at the various crash bar/cowl protector threads for some real life experiences. 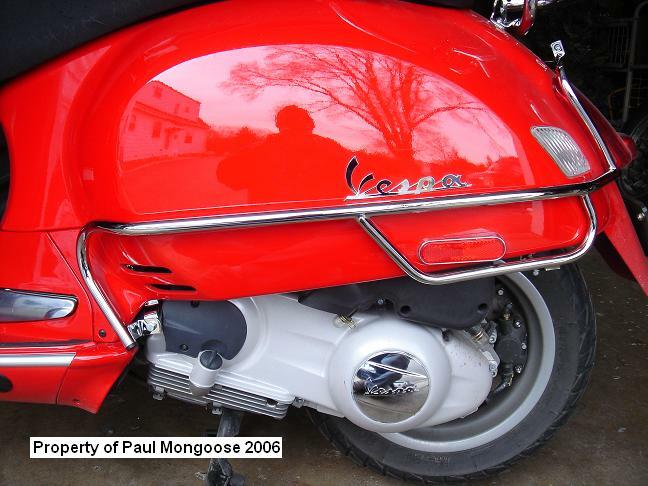 I have the Vespa bars, which I like because as mentioned before they leave a bit more space between the cowls and the bars and that seems to me would protect a bit more (admittedly, i have zero evidence to prove this point). I know some people dislike them for the same reason, because they stick out more. Since putting them on, I once dropped the bike slowly on rough gravel as my driveway was being repaved and the centerstand sank in the gravel on one side - no damage whatsoever, other than a couple minor scratches on the bar itself. Paid themselves right there. turq77: yes, they come out a bit more in front as they bend in and below the floorboard. I also have the Vespa bars, and can also confirm that in a slow-speed crash or drop, they'll more than pay for themselves. The cost of a professional repair of the damage my GTV would have suffered without them is way more than the cost of the bars themselves. As far as a major or high speed accident, every situation varies. 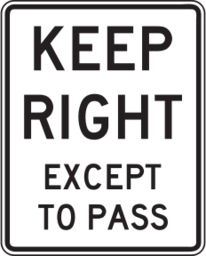 But for slower speed incidents (which are more common), they usually seem to help. Just make sure you put a blanket down on the rear of the bike so as not to scratch the paint when installing them...just my 2c worth. without them is way more than the cost of the bars themselves. Here a couple of photo's of the PX front crashbars on Greg's GTS. They were put on at Massimo's Vespa Shop today. where can you get a set of front crash bars? My Scoot looks very nice. Rear Crash bars are in route. I got those from Max @ Scooterwest. Just got the GTS 300 and want to put the OES bars on it but not at the expense of losing performance. Anybody know how much they weigh? Anyone added them and found a difference in speed/acceleration? They only weigh a few pounds, they are light steel. Won't affect performance at all but sure will provide protection if the scoot goes down. Without going into specifics my GTS300 flies ! I highly recommend these to any Vespa owner.